At a community meeting, Toronto police officers spoke to rattled residents of a condo building that was recently the site of a high-profile gang bust. 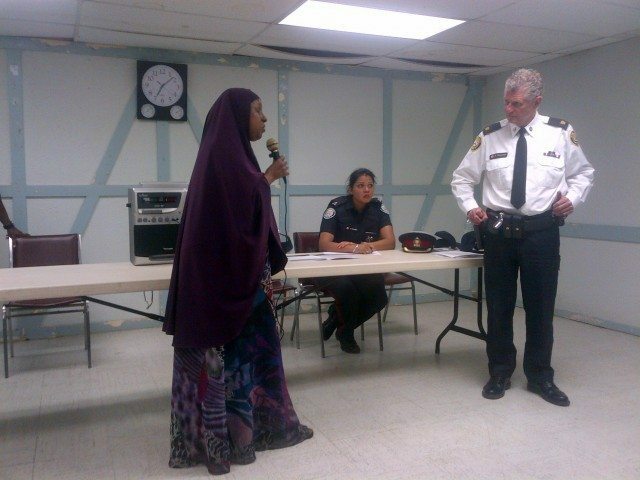 Police Superintendent Ron Taverner listens as a resident of 320 Dixon Road speaks at a community meeting on June 20. On Thursday night, Toronto Police Sergeant Chris Laush was standing in the party room in the basement of 320 Dixon Road, the highrise condominium that has been the site of recent police raids, a recent shooting, and numerous apparent connections to Mayor Rob Ford’s crack-video scandal. Laush told more than a hundred residents and neighbours gathered for a community meeting that in the wake of the raids, which were part of a police operation called “Project Traveller,” the Somali Liaison Unit he supervises will be initiating “Project Clean Slate,” to bring a renewed sense of safety to the community. Residents listened and applauded politely as Laush and 23 Division superintendent Ron Taverner introduced the other members of the unit, as well as Deputy Police Chief Peter Sloly. The police urged the community to look to the future, but most residents who came to the microphone during the two-hour meeting wanted to address both recent and long-standing traumas in and around the building. The first speakers were community leaders invited to the microphone by the police. Omar Farouk, who sits on the Toronto Police Service’s Muslim consultative committee, commended the officers. “I feel comfortable working with you and the rest of the officers,” Farouk said. Mohamed Gilao, executive director of local community centre Dejinta Beesha, said the Somali unit demonstrates a culturally sensitive approach to policing. “We welcome this initiative,” he said. But as more community leaders stood to thank the police, the impatience of many attendees became apparent. The state of the building itself was the most pressing concern for many residents. One man stood and complained that the condo building is overcrowded and crumbling. The stained, drooping ceiling tiles, chipped paint, and poor lighting in the basement illustrated his concerns. Another man asked if the police will have access to footage from the hundreds of cameras the property’s management plans to install in the building. “We’ve lost so much money in this place,” he said in reference to the diminishing value of his unit. Malik, the new president of the condo corporation, said his community members are victims of an unfair property-assessment regime. “The units that they bought for over $100,000 were not even worth $35,000,” he said. He added that security enhancements, vandalism, and false fire alarms have cost owners dearly. He finished by saying that the Somali community, and other immigrants in the area, have suffered because of unemployment and a lack of community programming. The meeting reached a crescendo when a young man in a ball cap named Kabir came to the microphone. He had been trying to speak for the entire meeting. “They say they’ve dismantled the gangs,” Kabir said as he gestured towards the police. “I don’t know a single gang that beats hundred-year-old women. They have no shame.” He was referring to reports of an elderly woman being injured during the raids. “The Toronto police has a long history of violence and brutality, not just in the Somali community, but in every African community,” said Kabir. “They don’t do this in the white community!” Some were applauding and saying thank you, while others shouted him down. Sergeant Laush unplugged the microphone and the meeting boiled over. One of the last speakers was Fosia, a young woman who also spoke at a news conference after the raids and said the police went too far. She addressed Taverner and Sloly directly: “The complaints that we have are still hurtful to us,” she said. “I hope you can respect me and care for me, and care for my peers, the youth, as you would respect and care for your own child.” Her voice was quivering but calm, and she managed to hold the audience’s attention with her words. “We don’t want to be vulnerable, we don’t want to be victimized; we want to be respected as Canadians, but above all, as human beings.” The meeting ended shortly thereafter.